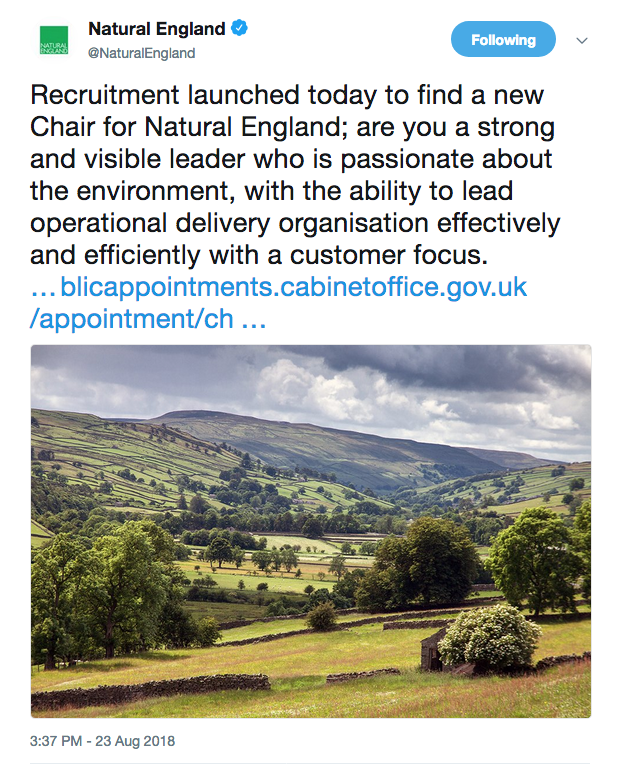 Natural England chairs come and go, and today’s publication of the advert inviting applicants to be the next chair, gives me an opportunity to look, once again, at the absolute state of Natural England. Some may feel all I do is bash Natural England whenever I write about them. As if NE-bashing was my favourite past-time. Nothing could be further from the truth – just yesterday morning I was defending Natural England from a demented attack by a Tory buffoon. I am often critical of Natural England – not because I want rid of a public body which protects nature, like some certainly do. But because above all else I want to see a strong regulator, working its collective arse off, for nature, in England. There are still plenty of people in Natural England doing exactly that, but every day, every little thing, makes their job a little more difficult. Let’s look at a few examples of these little things. Some have asked why the appointment of a leading pro-country sports Lord to deputy chair of Natural England’s board is even worth mentioning. And in mentioning it I have been accused of all sorts of dark activities, including “ethnic cleansing.” Honestly, country sports people, do grow a backbone. The point is not whether Blencathra loves hunting or not, its whether his love of hunting and other blood sports conflicts with the purpose of Natural England. One particular purpose of Natural England, for example, is as a regulator which job is to make sure laws protecting wildlife are taken seriously. Laws protecting species like Hen Harriers, and laws protecting internationally important habitats like blanket bogs. As if by magic, and purely coincidentally of course, news seeps out that Natural England staff are being educated on the environmental benefits of driven grouse shooting, on a grouse moor whose head keeper was prosecuted and fined for err setting illegal traps for birds of prey like err Hen Harriers. Natural England does need to work with the owners of SSSIs and European Sites on Driven Grouse Moors (while the latter exist, anyway.) But what I find deeply worrying is the idea that NE and owners of grouse moors are to be seen as partners, that NE should be “customer-focused” above all else. And if you think that’s wrong, go back to the top of the post and read the tweet from Natural England, describing what the role is about. I don’t even believe Natural England should be considering SSSI owners as customers. It’s not a shop! Natural England, above all else, is a regulator, whose job is to see the law effectively applied. There is no other regulator with that job. There is no-one else that nature can turn to, metaphorically, to ask for help. There is only Natural England. And if NE is too busy seeing how vital it is for grouse-moor owner’s to burn blanket bog, then it’s much less likely to take legal action against them to stop it. Natural England’s willingness to roll over and play dead when it comes to implementing the laws protecting our wildlife, has got so bad, even the RSPB is taking legal action against them, as is Mark Avery. Another Judicial Review against Natural England was recently rejected. This one focused on Natural England’s failure to consider the effect of badger culling on European Sites supporting scarce and vulnerable ground-nesting birds, feeding grounds for wildfowl and non-breeding roosts of rare raptors such as hen harrier. European Sites (Special Protection Areas and Special Areas of Conservation) have very strict legal protection – thanks to the EU. This means any project which might have an impact on the species and habitats for which those sites were designated, has to be assessed – the so-called Habitat Regulations Assessment (HRA). The claimant pointed to several instances where Natural England had failed to carry out HRAs looking at whether the badger cull would lead to, for example, a change in the fox population. Or the well-established perturbation effect, whereby culling badger causes surviving badger colonies to disperse away from their home areas. In a surprise judgement, the Judge decided that although Natural England had breached its duties under the Habitats Regulations, he was satisfied that they would have concluded that the badger cull would have had no impact on the nearby European Sites anyway, even without the proper assessments. Natural England appear to have relied on a reference to “routine monitoring” of protected sites, but their monitoring programme has suffered serious funding cuts so they don’t even know what state the sites are in, or whether the special species and habitats on them are doing ok, or have disappeared altogether. I understand an appeal is being considered. If I’m painting a picture of an organisation in crisis, which has lost all sense of identity, and purpose, perhaps you’re thinking this picture is as black as one of Goya’s black paintings, or reminds you of a particularly dark film noir. But I leave you with one further piece of evidence. Sue Everett reports in this week’s British Wildlife, that 200 NE staff are to be “reassigned” to work on “Brexit duties”. What she means is that 200 NE staff are being taken away from NE and transferred to Defra. Requests for volunteers have only resulted in 65 willing to make the sacrifice, so the word is that the others will be compulsorily reassigned. These are secondments, but who in their right mind would really believe they were going to return to NE in 2 years time? Still, reducing the head-count will enable NE to meet its ongoing budget cuts. These cuts, which have gradually been paring away at NE’s body since 2010, follow on from the transfer of staff working on countryside stewardship, which I wrote about earlier this year. The picture is an ugly one. Natural England is failing in its role as the statutory regulator for nature. It’s struggling against a rising tide of pressure from Defra and elsewhere not to rock any boats, especially with powerful vested interests like the Countryside Alliance. And its budgets and workforce are cut and cut again, making those that are left increasingly despondent. Who then would be interested in taking on the role of chairing this failing organisation? Given this Government’s previous record of getting away with political appointments, I predict we’ll see someone rewarded with a sinecure. It may be Lord Blencathra who is given the nod to slip from deputy chair into the chair role. He would certainly do Defra’s bidding without any dissent. Or it could be someone like Rob Wilson, who failed to get the Charity Commission chair because it was such a blindingly obvious political appointment. The outgoing chair had close links with Policy Exchange, Gove’s thinktank. So we could see another horse from that stable. The choice is academic though. I think it’s time we all agreed that Natural England’s time has come and gone. We need to start afresh. After Brexit, after the chaos of a crash-out no-deal no food on the supermarket shelves Brexit, after the smoke has cleared, it will be time to start rebuilding. This entry was posted in Andrew Sells, badgers, countryside alliance, Europe, Habitats Directive, Natural England, SSSis, Uncategorized and tagged badger cull, budget cuts, European Sites, Grouse Moors, Lord Blencathra, Natural England. Bookmark the permalink. 9 Responses to Rearranging the deck chairs on the Natural England Titanic. You could say the same for SNH. ERW I hear less about. In the case of EANI, though, despite the “Agency” in the title it’s not an independent agency but has always been an arm of government – currently DAERA; though it’s been entirely without a devolved minister for nearly two years now. I remember how the Countryside Alliance tried to sabotage any reform of Countryside access for the public…. It was said of the 2000 Access to the Countryside Act, Ramblers want to walk through your from garden!!!!! Why would anyone want to do that when what was asked for was access to open land.. commons etc. All common land is owned by someone and not much was open land, it is now……! It all goes to show that NCC and EN were too successful. They did what the law asked them to do the powerful landowners didn’t like it.